The Three Way Oilstone Sharpening System is the ultimate sharpening device. The system works by pouring oil directly into the reservoir and turning the stone holding assembly so the sharpening stone becomes submerged in oil. As you progress from grit to grit, you will always have an oiled stoned ready for sharpening. 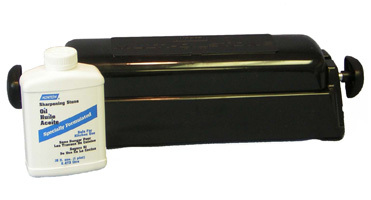 The Three Way Oilstone Sharpening System includes three different sharpening stones. It also accommodates any size knife and also comes with a pint of sharpening oil. This sharpener has been used by professionals in delis, butcher shops, restaurants, and other related environments for years.